Temple University's solar panels can be seen by approximately 26,000 regional rail riders.Although the newly installed solar panels are mounted three stories up on Temple University’s Edberg-Olson Hall, about 26,000 regional rail riders see them daily as they pass through the Temple University Station. The visibility is what the university is hoping will draw attention to the project, so more people see solar energy as viable. Although the newly installed solar panels are mounted three stories up on Temple University’s Edberg-Olson Hall, about 26,000 regional rail riders see them daily as they pass through the Temple University Station. The visibility is what the university is hoping will draw attention to the project, so more people see solar energy as viable. Temple and the company that installed the 4,500 square feet of panels, Radnor, Pa.-based Community Energy, say the array stands out as the first solar power installation on a Philadelphia campus. The panels were unveiled at the beginning of 2014. Joel Thomas, business development manager with Community Energy, says the project was made possible in part as an agreement that stipulated that Temple would buy the energy from Community Energy for the next 20 years. While the installation, the cost of which Community Energy is not making public, wouldn’t be there if Temple wasn’t buying the power, Community Energy’s Solar Builder customers made it possible by helping to subsidize the upfront costs through their utility bills. When people sign up to use Community Energy as their electricity provider, the company takes the profits and invests them in solar projects. Thomas says that it took roughly 1,600 customers signing up for Community Energy to help pay for the Temple project, adding that Community Energy doesn’t ask for donations from customers. “It’s like the idea of crowd-sourcing,” Thomas says. “The model works at scale—a large number of households participate and, as a community, solar is built.” Both Temple and Community Energy said covering the initial costs was an essential part of bringing solar to the campus. 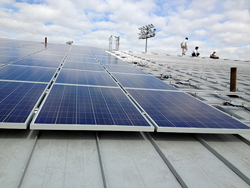 “We had been looking for ways to incorporate solar into the campus for a few years,” says Kathleen Grady, director of sustainability at Temple University. “[The subsidy] was the carrot that allowed us to get on board with the project,” Bresser says. Grady adds that Temple is the first school in the city to install solar, but she hopes it won’t be the last. “By working with [Community Energy] and partnering with them to implement this financial model, I think other schools are going to take notice and want to do something similar. It really helps us to make the case for solar,” Grady says. For more information on Community Energy projects, visit communityenergyinc.com.